Highly textured with purl and knit sts on both sides, guranteed to give those dishes a good scrub. 🙂 Easy and fun to knit. This cloth looks very nice on both side and can be considered reversible. In order to use up the entire ball of yarn, I cast on multiple sts of the stitch count about 26 sts and knit coaster till I ran out of yarn. 1st row: (RS), K3, p5, *k5, p5; rep from * to last 3 sts. k3. 2nd row: P3, k5, * p5, k5; rep from * to last 3 sts, p3. 3rd row: as second row. Cast on 47 sts and work 5 rows in garter sitch. Start pattern stitch above having first and last 3 sts between markers and keeping then in garter stitch. 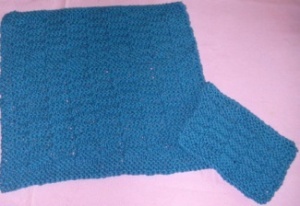 Continue in pattern until cloth is 10.5 inches or desired length ending with last row. Remove markers,working 5 rows garter stitch, cast off. Weave in ends an scrub those dishes.